I blame finals. It's not that I didn't have things to ramble about these past few months (that'll happen about twelve and a half years after the end of the universe), it's that I did have finals. And packing. So now I type this to you, my loyal readers (both of you), from Japan. Let's just pretend there was a time-warp and I'm posting in a timely fashion, okay? Last summer saw the premier of a new age of the Sci-Fi Channel... which is to say they changed their name to Syfy. But this summer also brought the premier of Warehouse 13 to the newly re-dubbed "Syfy," a series that gained the highest rating in the channel's history. This wonderful, wonderful show (that I just might've enjoyed a bit) has been renewed for a second, twelve-episode season starting on Tuesday, July 13, 2010. Oh, and Jewel Staite (Kaylee from Firefly and Dr. Keller Stargate Atlantis) and Sean Maher (Simon from Firefly) will both guest-star. This fills me with joy. Especially since they'll be playing opposite each other. Joy. 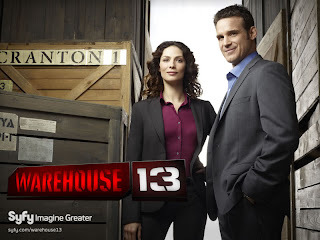 The Warehouse 13 agents collect unusual artifacts that are dangerous in some way or another and are often connected with famous historical figures and events (Edger Allen Poe, Harry Houdini, Lewis Carroll, etc.) and bring the artifacts back to the steampunk-esque Warehouse in the middle of South Dakota. It's set in the present, with contemporary clothing and buil dings and such but with tons of steampunk aesthetic in the technology used in the Warehouse and by the Warehouse agents, such as the "Farnesworth" communicator to the right. I know; cool isn't it? The mix of steampunk technology and modern technological capabilities make the Warehouse pretty dang cool and gives the show an interesting mix of atmosphere and adds a sci-fi/ fantasy feel to a "modern" installation... and it gives the main characters some pretty dang cool toys to play with. On to the characters! The series starts out with a rather small main cast, focusing on getting to know and developing the characters of Secret Service agents Myka Bering (Joanna Kelly) and Pete Lattimer (Eddie McClintock) who were recently recruited into the top-secret Warehouse of Wonder and Steampunkery. 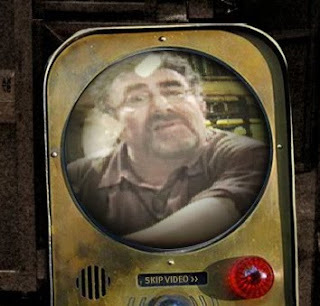 In the first few episodes, the only other character who shows up much is Artie Nielson (Saul Rubinek), who mainly stays at home base and tries to coordinate the agents activities. This bugged me. It's not that I don't like stiff, calculating Myka and goofy, improvising Pete's banter; I just like having more main characters and inter-character dynamics. Sure, Artie's in every episode and Leena (why does she know about the Warehouse?!?) appears occasionally, but they don't really interact with other characters all that often. The diverse cast of primary and secondary characters is one of the main reasons that Stargate SG-1 is my favorite TV series. Is it too much to ask that this already fascinating steampunk/ X-files-ish/ adventure (?) series just add a few characters? Claudia Donovon (played by Allison Scagliott and seen on the far left of the promotional image to the left) is a young "genius wiz-kid" (mad scientist hacker) connected to Artie's past. She's an entertaining character that shakes things up and throws Artie off-balance with her rule-bending, superior knowledge of the cyber-realms, and razor wit. Oh, and there's also that whole "connection to his past" thing I mentioned; the point is, Claudia allows the viewer to learn more about Artie as a person instead of just a kind of distracted mission control. Episode five, Claudia strikes back and joins the main cast, helping Artie at the Warehouse and befriending the other characters. And Ryorin rejoices. And then Leena (the aura-reading owner of a Bed & Breakfast, played by Genelle Williams) starts showing up more and even Mrs. Fredric (the ageless, shadowy director of the Warehouse, played by C.C.H. Pounder) starts checking in occasionally. Sometimes dreams do come true. What is up with Mrs. Fredric? There is clearly more to her than meets the eye; how did she become involved with the Warehouse? What are her goals? How old id she, anyway, and how is it that that can be a serious question? MacPherson: Introduced in episode seven, James MacPherson (played by Roger Rees) is the Big Bad of the season, but what are his goals? We do learn about his past, but where do his loyalties lie? What is does he hope to accomplish, exactly? This question I really hope is answered next season, especially considering the first season finale. Leena: What's her connection to the Warehouse, anyway? This is the thing that really bugged me about the past season. I mean, sure she runs the Bed & Breakfast the agents live at, but is the ability to make killer waffles license to wander around the world's most top-secret installation? Does she have a last name? Is it important? And why can she read auras? There are other questions about her raised by the finale, but these are the questions I've had about her since before that. The Warehouse: everything. This is the most obvious mystery of Warehouse 13. What is the history of it? Who runs it? Why concentrate all of the artifacts in one place? And what is that purple goo? I could go on about this, but I'm pretty sure most of this (except the goo question) will be addressed next season. Claudia's brother: what's he been up to, lately? Have there been any side-effects from his earlier experiment? Has he become addicted to online games, or did he get a job? The world wants to know! Pete the Ferret: Does he lead a double life? Does Pete the Human ever learn why Myka's ferret is named after him? How do the events of the season finale affect him? Does he like blue jello? Mirror, Mirror: Can Lewis Carroll's mirror please be used again? Please? Well, that about covers it. Oh, except for my need to mention how aweso me it was that Joe Flanigan (Jack Shepard in Stargate Atlantis) guest-starred in episode five and Myka's actress played Bianca in The Dresden Files TV series (which was... weird...). Oh, science-fiction actors! I love how I can actually recognize them! Needless to say, the second season is something I'm very much looking forward to this summer. After the shocking finale of the first season, I await July 13 with high hopes and many questions for season two.